I've been thinking that chalkboard walls would be fun in the kids' bedrooms. When I mentioned the idea to my kids, they were all for it. Especially my 10 year old. He kept hounding me to get started, and I finally did this past weekend. Originally we were going to paint an entire wall, but instead we decided to paint just a section of the wall. I really didn't measure or make perfectly straight lines. I'm lazy daring like that. 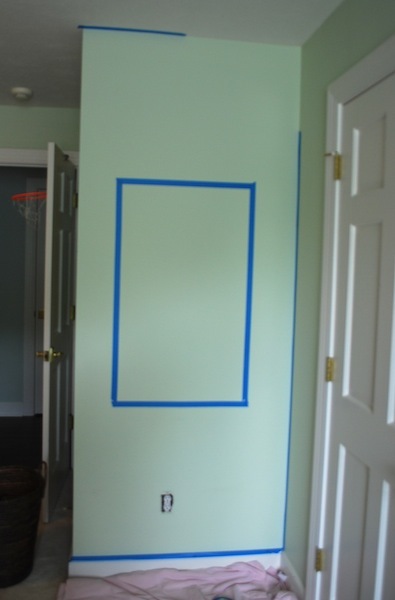 If it looked really bad, I'd just paint the entire wall. Makes sense, right? Sort of. Honestly, it was the only one I could find. Well, look at that. It's already being put to good use. Your son has your great sense of humor!! I love it, much better than a whole wall. I wish I had a place to do this! What a fantastic idea and I hope that prediction comes true. That is hilarious! I love how cute it looks in his room. My 11 yr old has one painted over his bed and framed in trim. 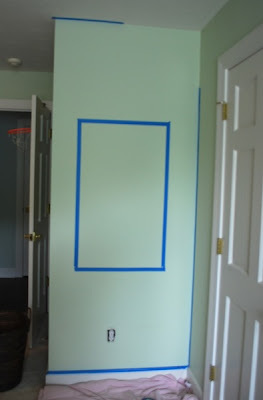 You could always add trim around yours if you wanted to as well. I love that first room pic you featured! I love it and I am sure is a great vehicle to release frustrations by writing thoughts. My friend has an adult who sometimes forgets his responsibilities and rather than yelling at him, she puts all reprimands in an email. When she meets him for supper they can visit as friends. Carolyn, What an handsome young man! And I see he is taking his lesson very seriously! 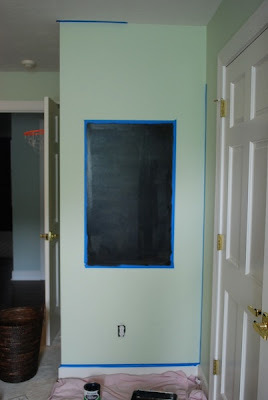 I love the idea of painting a chalkboard on his wall! You can write out his chore list!!!! I am a new follower! Great blog! Well that is just too cute! I can't believe you got him to write that, plus such nice penmanship! Lol, this is hilarious, Carolyn. We have a huge one in the 11 year olds room, and she actually uses it to practice math problems, and do spelling. It was money well spent for sure. Tell your little guy he made this into a cute post! Ha!! Your son is a cutie! What a gorgeous smile!! your chalk board project turned out brilliantly! I really like it lots!